← Tales from the Bus. Parenting. Interesting!! So simple, yet I had never thought in these terms. The Sabbath is clearly and undeniably a Creation Ordinance. It was given before Adam and Eve sinned! Therefore, if all of the work of redemption (Romans 8:18-25) is to restore that which was broken/lost at Adam’s sin, then the goal is a return to Eden. And, what is at Eden? 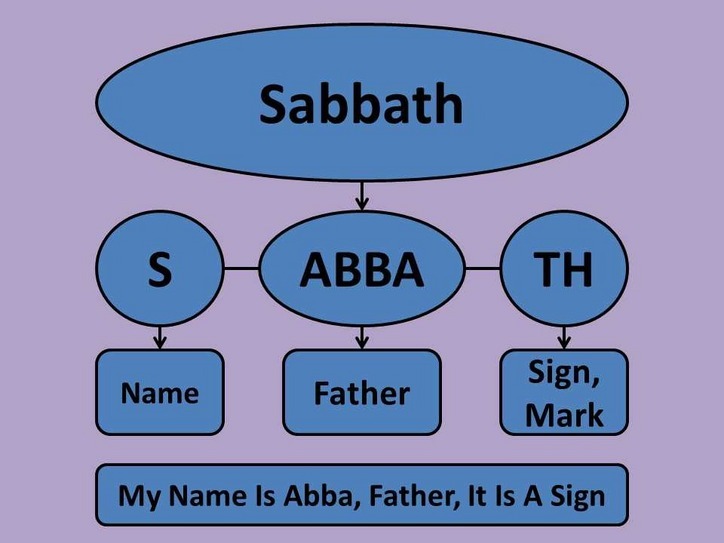 The seventh day Sabbath!! This entry was posted in Sabbath and tagged Chris Rosebrough, Garden of Eden, Jim Staley, Romans 8, Sabbath debate. Bookmark the permalink. I assume the ? ?s have to do with the image. I just thought the image puts them together interestingly… The only real question is the ‘S.’ Can it indeed mean/point to ‘name’ as the illustration asserts? The other two easily fit. That statement Jim made (“If man had not sinned, what day would we be celebrating for Sabbath?”) stuck out with me also. It was given to Adam and Eve before the fall. I wonder how long Adam and Eve were in the garden before they listen to satan? Good point to reiterate Pete. Likewise, had Israel not been so stiff-necked and adulterous they would be kings and priests to all the nations and thus, again, would we not be keeping Sabbath?